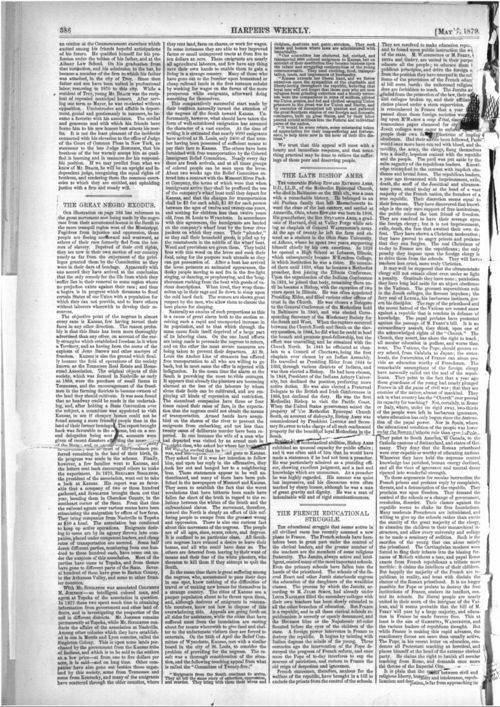 This article published in the nationally-renown newspaper Harper's Weekly discusses the black exodus from the South, stating that Kansas seemed to be the objective for many of these emigrants. In particular the article discusses the role of the Tennessee Real Estate and Homestead Association, led by Benjamin "Pap" Singleton. This article provides a general introduction to the Exodus that could be used as a starting point for students. This could also be grouped with other sources about Singleton, such as images of him, the certificate of incorporation for the Singleton Colony, and sources related to his last settlement called Dunlap, Kansas.